I’ve put together the material in these ebooks to help you really gain a thorough knowledge of your instrument, in combination with music theory fundamentals for practical use in any situation. All of the eBooks on this website are available as downloads only. Once your purchase is complete, within a few minutes you’ll be emailed a link you can use to download the eBook. Click on the ebooks below to view details. 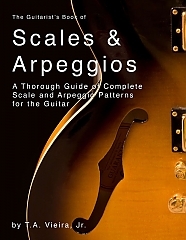 Comprehensive scale and arpeggio patterns that cover the entire fretboard. Solo in any key, anywhere on the fretboard! Over 300 Movable chord forms covering any and every chord you’ll ever need! A Chord/Scale Application Chart that shows you what scales will work over which chords. Take away the guess work of making your solos sound good! Over 60 step-by-step exercises that smoothly and easily lead you through the process of understanding music theory and applying it to guitar. Be able to understand and recognize chord progressions, know what key you’re in, know what scales will give you the sound you want in any situation. Understand how music works! Knowing theory can make you a confident player in any situation. This book can help you with that confidence! Altered dominant chords are one of the staples of jazz. Some may even say that these chords create a lot of the sound and color that defines the jazz “sound.” Being able to not only solo over those types of chords, but also create those kinds of sounds in your solos is an invaluable strength to have as a player. 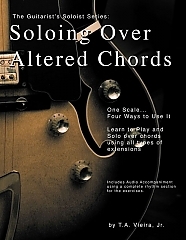 Achieving these kinds of sounds may seem a little complicated, but this book, Soloing Over Altered Chords, teaches you the melodic minor scale and arpeggios, and four different ways to use that same scale to achieve any kind of altered dominant sound you will ever need. One scale, four different ways to use it! That’s it! Pretty simple, huh? First the book starts off giving you a comprehensive knowledge of the scale patterns for the melodic minor scale and arpeggio. You’ll know the scale from one end of the fretboard to the other. That way you can be anywhere on the fretboard, at anytime and be able to solo in any key. Each chapter after that explains one of the four ways you can use the scale, then takes you through exercises for you to familiarize yourself with that particular application. The exercises start off helping you get familiar with one sound at a time, then as you get further along in the book, you’ll work with common ii-V-I progressions in major and minor keys so you can work on using the “altered” sounds in context. The audio files (mp3) that come with the book contains full rhythm section accompaniment for each exercise so you can easily practice and strengthen your ability to use the scale creatively. 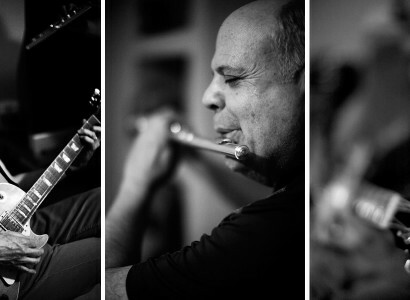 It’s like having your own band to practice these new concepts with, whenever you want! 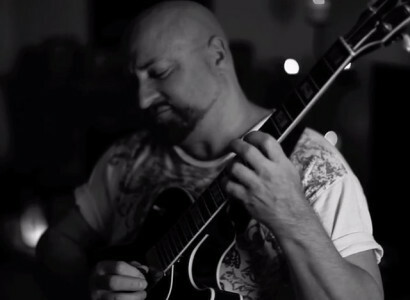 The ability to define altered dominant sounds in your solos is a strong building block in helping you to become the most accomplished, creative player you can be. This book can make that learning process a lot simpler for you. When you’re standing on stage performing in front of an audience and you know your solo is coming up, the last thing you want to have to worry about is thinking too hard about what you’re going to play; or to have to struggle, searching for the notes of the key you’re playing in. Or maybe you’re in the middle of the solo, working your way up the neck and all of a sudden you’re not sure of a scale pattern for the key in which you’re playing in that particular area of the fretboard. Choking during a solo is never fun! A thorough knowledge of scales and arpeggios from one end of your fretboard to the other is priceless. It frees you up to express your musical thoughts without having to think of the mechanics of how to do it. Improve your right and left hand coordination, helping the two hands work smoothly together. Develop the muscles in your hands and arms used in playing guitar and greatly improve your dexterity to allow you to solo over the fretboard with ease and speed Familiarize you with the layout of the fretboard, allowing you to easily picture the scale and arpeggio patterns from one end of the fretboard to the other, in any key, allowing you to see the note choices available to you to make your solos sound great. Automatically train your ear to intuitively hear intervals and how notes relate to one another, giving you the ability to know how to create the solo ideas you are hearing in your head. 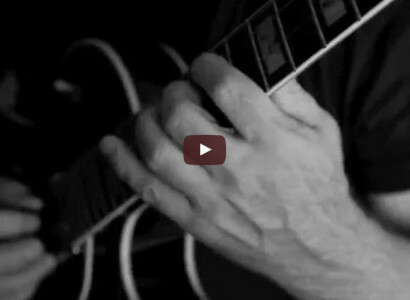 Cut out the guess work and provide you with the working tools to be a great soloist on guitar. Being a great soloist is something that players can work on their entire lives, striving to be the best they can be at expressing the music that they hear in their head. The pages of this book can move you along faster, helping you to become the player you want to be. Note that much of this material is covered in Essential Concepts. 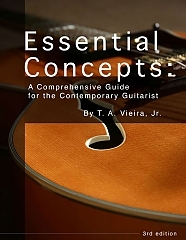 There are some slight variations, but if you purchase Essential Concepts, this book probably isn’t necessary.